How do I Deal with One Missing Tooth? that has gone missing, you may find it difficult to speak properly, chew food in a normal way, or even smile without being embarrassed. One missing tooth can make your smile look unhealthy and incomplete – especially if the location of the missing tooth is in the front part of your mouth. In cases when the lost tooth is located on the back part of your mouth, you may find it difficult to chew your favourite food in a normal manner. What should you do when you lose one tooth? A dental implant can replace the form and function of one tooth that has been lost. The dental implants will be embedded onto your jaw bone, where the missing tooth was previously located. The titanium dental implant will then be attached to a dental crown, which will serve as the replacement for the tooth that has been lost. 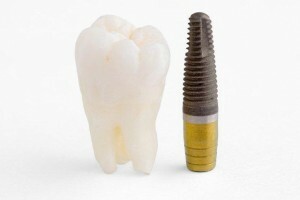 The dental implant will successfully bridge the gap or space that was left when you have lost one tooth. The loss of one tooth should be treated as seriously as the loss of several teeth, as the missing tooth can pose the same problems as several missing teeth. Going for a dental implant to replace your missing tooth can bring back the quality of life that you deserve to enjoy – and will enable you to flash the brightest and most complete smiles once more!